So many things to do in Connecticut! 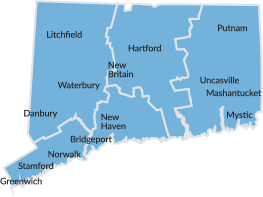 Connecticut offers such a dynamic blend of things to do. From beautiful beaches along the Connecticut coast to scenic green trails throughout the state. From some of the world’s most exciting casino resorts to some of New England’s most picturesque camping grounds. From challenging adventure parks to stimulating museums. They’re all so close to you — and all so close to each other. Animal lovers of all ages can see eagles soar and hear tigers roar at one of the many aquariums, zoos, nature centers and wildlife parks in Connecticut. Connecticut is an antique hunter’s dream come true, with shops, dealers, galleries, auctions and flea markets all along the Connecticut Antiques Trail. The Connecticut shoreline offers miles of picture-perfect New England beaches, punctuated with inviting beach towns, tiny islands, lighthouses and bike trails. From kayaks to schooners, river cruises to river rapids, to sailing on Long Island Sound, boating in Connecticut offers hundreds of ways to make a splash. From IPAs to seasonal ales, small batch vodka to artisan moonshine, come see what’s pouring at Connecticut’s craft breweries and distilleries. Connecticut casinos are much more than slots. See why ours have become premier destinations for dining, shopping and entertainment in the Northeast. With amusement parks and beaches, museums and nature centers, there are enough family activities in Connecticut to keep everybody entertained. History comes alive in Connecticut, in museums dedicated to Native Americans, our maritime legacy, our tradition of innovation and our colonial-era heritage. Experience Connecticut from above, with all kinds of “up in the air” adventures, from skydiving to zip-lining, hot air balloon rides to high wire walks. Connecticut offers so many different ways to enjoy the live music experience, including outdoor and indoor concert venues, theaters, clubs, festivals and more. In Connecticut, some of our most exciting experiences happen after dark, in urban dance clubs, music halls and world-class casinos where the pace never slows down. Connecticut offers downhill and cross-country skiing for everyone from beginners to boarders, with something for snow lovers and winter sport enthusiasts alike. Just a short ride from the lights of Broadway, you’ll find your ticket to New England’s best theater scene in Connecticut’s award-winning regional theaters. Inviting and picturesque Connecticut vineyards and wineries offer wine tastings, fine dining, picnics, festivals and events and much more.